Hopwood-based artist Paula Hamilton meets two in-demand local sculptors. As a young child I don’t remember being aware of sculpture as an art form. It’s not that I wasn’t interested in art, but I thought art was painting: 2D art. The 3D work that was familiar to me was of carvings of saints and dead priests in Canterbury Cathedral, near where I was brought up. These were certainly very intriguing but I was also rather terrified of them – life-size stone corpses were “spooky”. My parents took us to Florence when I was eight years old to see Michelangelo’s statue of David, but I regret to report that I was too hot, too tired and too little to get very much out of the experience. Then suddenly, during my teens, Henry Moore was on the scene with his huge semi-abstract bronzes set out of doors, and I became aware of Barbara Hepworth’s wonderful sculpture around the same time. Suddenly it seemed that sculpture was everywhere, no longer just in the confines of museums and churches. I like sculpture as part of the landscape, and there are some great sculpture trails and parks now in existence. 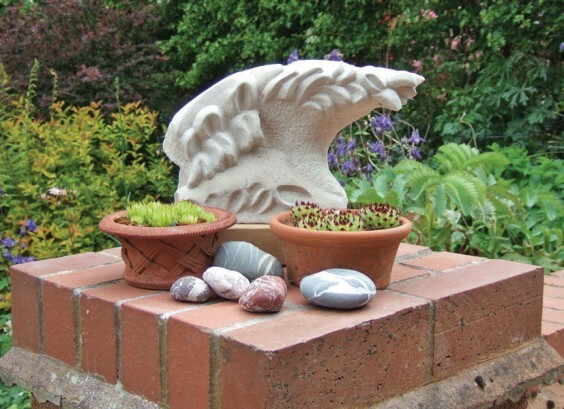 Viv Astling is a stone carver based in Birmingham who also believes that sculpture looks great outdoors. Viv has been carving stone for more than 30 years and now has his first major solo exhibition, although his work has been shown in galleries and gardens across the country many times. He is a sculptor member of the Royal Birmingham Society of Artists (RBSA), and his show, Stones @ Home in the Garden, will be at the RBSA Gallery in Birmingham’s Jewellery Quarter from August 24 to September 5. The exhibition features garden sculpture in particular, as Viv has the view that garden centres generally offer a poor range of sculpture for the discerning gardener. The themes of his sculpture accord with the garden, being based on natural forms often to be found in the garden. Viv will also be showing smaller sculptures for the home as well as some of his “Touch” pieces, which invite the viewer to experience the tactile quality of the stone. His first bronze, Sea Symphony, will also be in the show. This is part of a series of sculptures based on the 19th-century Japanese print of the Kanagawa Wave. All the work will be on sale and prices range from £125 to £2,500. The second sculptor I have news of is Andy DeComyn, also based locally, and who has also been working in stone for over 30 years. Andy is an experienced public artist who has carried out prestigious commissions in Britain and Europe. He works in a variety of media, including bronze and wood, as well as pioneering a new way of working with concrete to create truly unique sculptures. He works both figuratively and non-figuratively and from small to monumental in size. Andy has produced many beautiful sculptures for indoor and outdoor locations over the years. His website is http://www.publicart.co.uk, where there are many images of his work and information about his career and techniques. The National Memorial Arboretum in Staffordshire is one of the things that links these two sculptors. Viv’s commission at this venue was on behalf of the RAF Boy Entrants Association, who asked him to produce a monolith at the centre of their memorial garden in the Arboretum in Alrewas, Staffordshire. Viv designed and carved a two-tonne Ancaster monolith, which was unveiled in September 2004 with considerable ceremony including a fly-past by an aircraft from RAF Cosford. For the same Arboretum, Andy created a gift to the relatives of executed soldiers from the First World War, which consists of a one-and-a-half-times life-size statue of a young blindfolded soldier surrounded by 306 wooden posts, bearing the names of the executed men. To the front are six fir trees that represent the firing squad. The statue was self-funded and the posts and landscaping were paid for through donations. It was unveiled in 2001 to enormous media interest and was considered instrumental in the pardoning of the 306 men it commemorates. It is the only memorial that commemorates all of these men and remains one of the most visited memorial at the NMA. And now you can get a taste of what it is like to work in stone and learn to carve something yourself! Andy DeComyn is offering an opportunity to learn how to carve stone in the unique setting of the ruins of Bordesley Abbey where stone masons would have laboured hundreds of years ago. The end product will be a medieval style gargoyle; all tools are provided. This will be a two-day workshop held on Saturday September 19 and Sunday September 20, 10.30am to 4.30pm. Cost £150. Booking in advance is essential as places are limited –please phone 01527 62509 to reserve your place(s).